In the world of web development, forms are basis of most of your application. Everything that is displayed comes first from a form. The Zend Framework includes a wonderful form class, Zend_Form, that makes it easy to create elements, and when the form is submitted, to filter and validate the user input. What is not so wonderful, are the default decorators that Zend_Form uses. Decorators are used to render the various form objects (such as the elements, display groups, or the form itself). Most are optional, and nearly all of them come with customisable options. By default the Zend_Form object will render the form with a definition list. Likewise, the Zend_Form_Element_* obejcts render with a definition description (dd), and if you use a label, a definition title (dt). 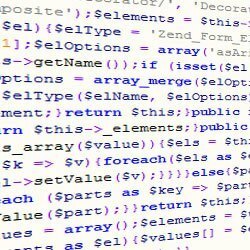 In this post I have shown how to remove the default decorators from your Zend_Form object and elements. This has been a very simple post to show how to achieve something specific. I shall be writing a follow-up on Zend Form Decorators, explaining what they are, the Mandatory Decorators, the Common Decorators, the Common Options and a LOT of examples to demonstrate how flexible and versatile Zend_Form is.